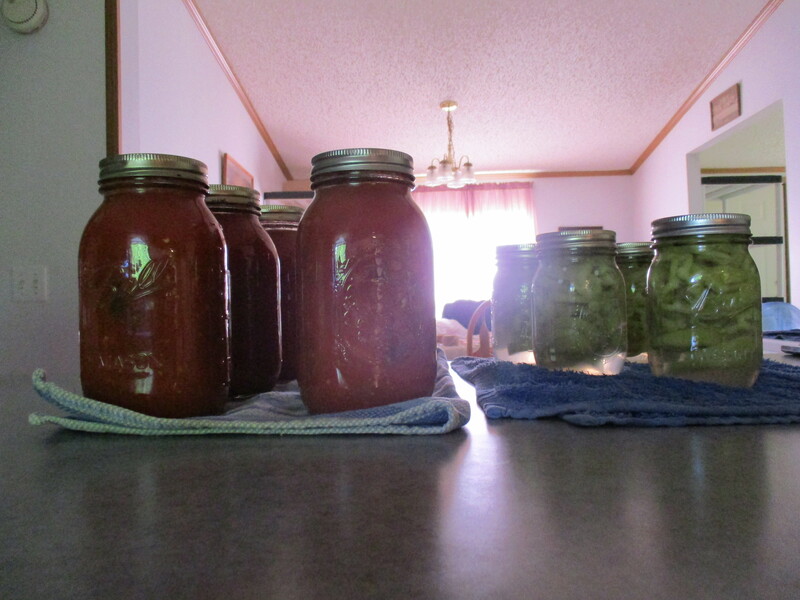 For the past week or so I’ve spent at least a portion of every day either making soap or canning pasta sauce. I’ve been becoming reacquainted with my kitchen as the tomatoes have been ripening at a quick pace, and I also realize that the holiday shopping will be getting in full swing in November about the same time as the soap that I am making now will be ready to sell. Canning the pasta sauce is always a joy for me because it is a family favorite, and because in a good growing year all of the ingredients, except for salt, sugar and a bay leaf, come from our garden. This was a good growing year, although since our tomatoes were slow to ripen I did buy some, and I’m still not sure that I have as much sauce as I would like to get us through the year. The soaps that I have been making are some that I feel are my better sellers. Last week I made a batch of the Soap and Shampoo bar and also a batch of my Breakfast Bar soap. When tested by my myself, my husband and my sister, this soap recipe gets very positive reviews. The last batch I made is a split batch. Half is Chamomile/Lavender, and because I just can’t help myself when it comes to trying new things, the other half is soap with aloe in it. I was looking at the aloe plant in the living room the other day and decided that since the plant is healthy and has even reproduced (cute little baby aloe plants), that I could afford to use a few of the leaves for soap. If the plant was small and struggling I would not have done this as I think it is most important to have this plant for first aide treatment for burns. In fact I think everyone should have an aloe plant in the house just for this reason. To treat a burn with aloe leaf simply break off a leaf, split the leaf open and rub the inside of the leaf on the burn. It is very soothing and in my experience healing. Aloe is suppose to be healing and moisturizing to the skin and is being used as an ingredient in by many commercial soap and skin care companies. I can’t make any claims as to the effects that aloe in my soap will have on the skin. I question whether the benefits that may be in fresh aloe are lost during the processing of the soap. Because of this I added the aloe to the soap, late in the process, after the oils and lye were combined and had come to a trace, just before it was poured into the mold. This soap will not be ready for trial for about 6 weeks. In addition to making sauce and soap, I have been cleaning bees wax, and have made a batch of Ruth’s Favorite Face, Hand and Body Balm using bees wax from our hives, and I will be making lip balm later today or tomorrow as well. While I’m thinking of it I also want to mention that the clover blossom soap that I made a while back will not be added to my store. It did not pass our testing phase, even though it lathered nicely and felt good on the skin, it made an unsightly mess in the shower as the clover blossoms came out of the soap, and this is unacceptable. Although clover blossoms, in our opinion, do not belong in a bar of soap, I will continue to experiment with infusing them into oil to perhaps add to some of my recipes. Pingback: Soap Testing | Don't Eat It!